Needless to say, this is a story that tells itself. If some documentary filmmakers are like gold miners, scouring to find a phenomenal nonfictional story within heaps and heaps of less-interesting ones, “Finders Keepers” is that piece of gold which directors Bryan Carberry and J. Clay Tweel were lucky to find before anyone else did. This is a story that comes with rich, fascinating subjects, atmosphere, fantastic dialogue, (“He thought he was gonna be, y’know, the next Billy Bob Thornton!”) insatiable costume design, and a bizarre chain of events, all waiting for a documentarian’s vision (as is often the case, fiction film could never do this justice). At one time, this was the type of pursuit that led to Errol Morris’ “Gates of Heaven.” Now, in the spirit of that albeit untouchable film we have “Finders Keepers,” a fantastic story that touches upon all-American notions of celebrity, redemption, family, justice, class, meme culture—all which came together with a kooky news segment. This Sundance 2015 selection and winner of “Best Comedy” at the 2015 Traverse City Film Festival is a ridiculous story indeed, as John’s mother Peg will state herself, or the grin on his brother-in-law Tom will nudge, as he shares his talking head offerings like he were about to finish telling a joke. 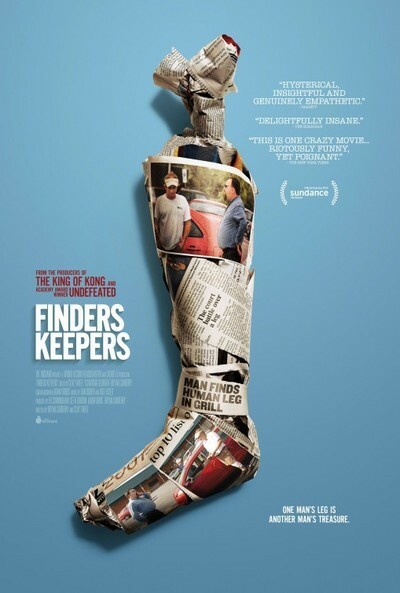 But “Finders Keepers” succeeds with a staggering amount of empathy when its narrative focuses on more than a prized foot, and centers on two men experiencing life phenomenons bigger than them. The film invests a lot of time in talking head reflections of John's addictions, and the apex of self-destruction he hit because of the money and attention given to him by the foot fiasco. Meanwhile, Shannon tries to understand his degree of celebrity, boasting big dreams of becoming a beloved, wealthy entertainer through his reality show appearances; a fantastic but crushing moment in the third act shows Shannon experiencing first-hand a reality show audience’s attention span for him as “The Foot Man." Inserted news reports label these eccentric events as a “freak show” but “Finders Keepers” unquestionably resists a mean spirit. This doc doesn’t get into the type of designation of heroes and villains, as previously chosen previously by one of its producers, Seth Gordon, who broke into filmmaking with 2007’s “King of Kong: A Fistful of Quarters.” (Although that doc’s nemesis Billy Mitchell does get an “Awesome Thanks” in this film’s closing credits). “Finders Keepers” wisely and warmly treats John and Shannon, both Davids to society as a Goliath, with a caring touch, expressing their very human nature defined by the comedy and tragedy within each. Their story is immensely entertaining, but the lunacy of these events is never out of their own understanding. Carberry & Tweel are pretty sharp as to how much the story tells itself, and often don’t mess with its natural order. On the other hand, aside from some driving score choices, or some select, pretty shots of B-roll, it’s as if the filmmaking loses personality to the eccentricities of everyone on screen. And in terms of assembly, “Finders Keepers” is a tad messy—we know that reenactments were filmed earlier than the leads’ dominating interviews (per Shannon’s haircut as a time mark), but we aren’t sure where the filming exactly takes place in the overall foot saga, especially as the impressions John and Shannon have on each other seem to change throughout. It’s an unnecessary distraction that overcomplicates a story that proves to have a beautiful, simple grace. In a very rare reflex even for the movies I already treasure, I was moved to watch "Finders Keepers" again immediately after the first viewing. This documentary is just so welcoming—and for events that defy believability—that I wanted more time in its atmosphere (the 83-minute running time is still just right). Sometimes you just find something that grabs ahold of you. In one of "Finders Keepers'" greatest gifts, it is inspiring how clear and clean the filmmaker's intentions are, especially against public opinion's regular impulse to quantify unusual headline subjects as memes from a 15-minute circus (the film wonderfully continues the ideas from the end of "Amy," which is also one of the best documentaries of the year). "Finders Keepers" is able to pack in all of this bizarre tale's inherently kooky colors—and have a great deal of fun with them—but its heart is always in the right place.